Being eco-friendly extends far beyond simply separating paper from plastic. Our food choices also make a huge impact on the Earth, and overfishing is threatening the existence of many types of fish and seafood. Learn which varieties are sustainable and what you may want to reconsider. Not surprisingly, many of the most popular fish varieties are no longer considered sustainable. Atlantic salmon, for example, is virtually extinct and should be avoided at all costs. Alaskan salmon, on the other hand, is a very sustainable choice. A lot rests on where the fish comes from and how it is caught. Albacore tuna from the US and Canadian North Pacific caught with troll or pole gear is an excellent choice, while albacore tuna from the North Atlantic that is longline or wild-caught is not. Farmed tilapia from the US is considered a top choice, while farmed tilapia from China and Taiwan is considered unsustainable. To ensure that you are making the most sustainable seafood choices every day, consult guides like Seafood Watch, Blue Ocean Institute, Greenpeace, and the Environmental Defense Fund. Download one of their free apps or print a pocket guide so you can check it on the go and learn what alternatives you should choose over unsustainable options. 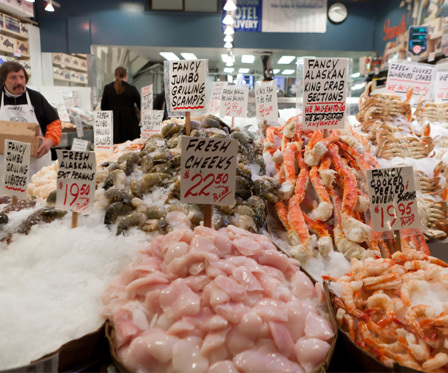 Don’t be shy about asking questions, whether of your fishmonger or at a restaurant. If you’re not sure, then consider opting for less popular types of fish. Instead of cod, go for haddock. Rather than Chilean sea bass (one of the least sustainable options out there) give mackerel a go. Arctic char makes an excellent alternative to salmon and is a very sustainable choice.